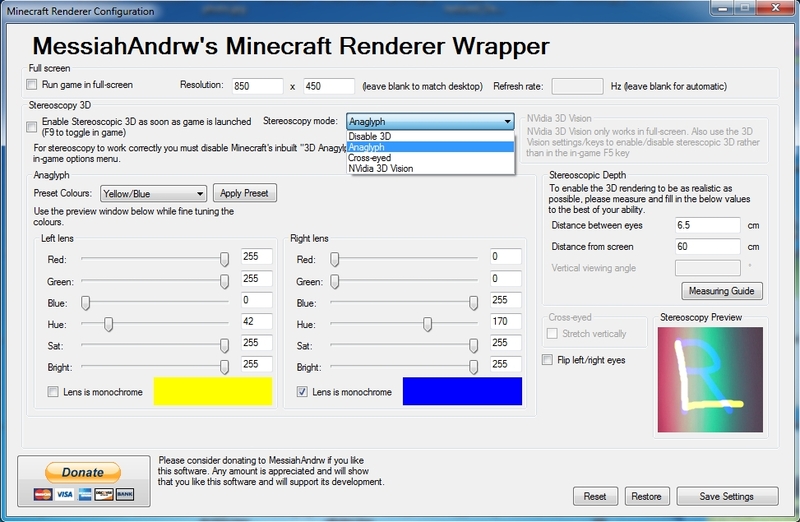 This mod for the game Minecraft called MessiahAndrw's Renderer Wrapper enables you to play Minecraft in a variety of 3D modes as well as customize the full screen mode, you can use it to play in anaglyph 3D mode with pretty much any color combination for the lenses, cross-eyed mode (probably not very convenient for longer gaming sessions), and with 3D Vision. The mod offers simple to use and quite powerful interface to setup the desired stereo 3D mode and settings. Whenever I try it, however, the motion in Minecraft is so blurry with tracers that I turn it off pretty quickly. Looks great besides the blurriness, but not quite there yet overall. The motion blur does make it rather hard on the eyes but when you're not moving the camera, it looks absolutely fantastic. I try to only move the camera slow when I play with this mod on. Another annoyance is how you can adjust the "Distance between eyes" in-game but not "Distance from Screen" (which is just a re-wording of image separation and depth amount respectively). It was tedious trying to find the optimal values based on my personal preferences and needless to say, I did not end up going by how far I was from the screen. I do wish this was still worked on though as I'd love to see it improved (starting with that nasty motion blur being fixed).